Sleek, slim and packed with great features, the Celcus 47" Full HD 1080p LED 3D Smart TV offers amazing picture clarity with Full HD 1080p detail, and the chance to enjoy 3D movie magic too! Its screen size is 47", making it excellent for viewing films and important sporting events, while built-in Freeview gives you access to free-to-air digital programmes. Two HDMI ports and two SCART sockets make this screen the ideal centre-piece of a multi-media set up - connect it to a Blu-ray player, games console or satellite/cable feed and enjoy all that HD TV can give! The USB port enables playback of stored media, while a headphone socket means others are not disturbed when they're in the same room! Comes with four pairs of 3D glasses. contact us. I have the 42" model, I can recommend buying one. Don't let the name put you off. Could u help me with a few questions mate please? Does this model have a reflective screen or is it matt? Would it be fine for daytime? What are the blacks like? What has the colour of someones skin got to do with it? Anyone found a dongle which is compatible for this tv please? I have bought a Linksys AE1200 which doesn't seem to be recognised. 2. No built in wifi (not stated but also not stated that you need a dongle on website or on the box) Again Sainsburys amending. 3. Technical at sainsburys cant tell me which dongle to use but did hint tv's may be linked to Toshiba? so a Toshiba one may work but please borrow one first if possible as i cannot confirm this in any way. 4. No freeview HD channels although it clearly says on website you do have built in HD freeview. This may be something I am doing wrong any help would be appreciated. Xbox/kinect has turned it into a smart tv with voice and motion controll anyway so that is quite good. Overall very pleased with picture and sound for price. Have not checked 3D Yet. Anyone had any joy with wifi dongles please let me know. Anyone know if you can re-flash a std wifi n dongle to give it built in driver for tv to accept? Just got mine delivered. Had to wait over a week but well worth the wait it seems. Currently family watching sbs 3D of Brave from the media player - amazing quality! Not tried the freeview setup yet, but have virgin connected anyway. Have ordered a 300mbps wifi dongle with the hope of connecting. From what I can gather you set it up on your pc then connect to the TV. Will see. Lovely size, good bargain - brilliant! As for hdmi there are 2, but if you need more just get a splitter adapter for a couple of quid. If you're considering this don't wait anymore. Some research by me has found that its an LG system in a Celcus box - assembled in Turkey, so don't be afraid of the name! Just got mine delivered. Had to wait over a week but well worth the wait … Just got mine delivered. Had to wait over a week but well worth the wait it seems. Currently family watching sbs 3D of Brave from the media player - amazing quality! Not tried the freeview setup yet, but have virgin connected anyway. Have ordered a 300mbps wifi dongle with the hope of connecting. From what I can gather you set it up on your pc then connect to the TV. Will see. Lovely size, good bargain - brilliant! As for hdmi there are 2, but if you need more just get a splitter adapter for a couple of quid. If you're considering this don't wait anymore. Some research by me has found that its an LG system in a Celcus box - assembled in Turkey, so don't be afraid of the name! Hello... mine got deleivered today too.. I have also found loads of cool features..
Hiya ive just bought one of these tvs but havent even taken it out of the box yet after reading the reviews re the wifi dongle. exactly what it is. Im a bit of a technophobe im afraid! Sainsburys are no help whatsoever and as i know nothing about dongles i dont even begin to know what im looking for!! Also i wanted a smart tv in order to watch movies on netflix etc directly on the tv. Ive been told that watching them over wifi then they'll be slow and keep pausing. Is this true?? Really dont know whether to keep the tv or return it! Mmm. It seems Sainsburys have been a little generous with the truth with this set. Firstly delivery was longer than expected, can live with that. Then I look at the box and it doesn't state half the things the website did when I bought it at half 6 Boxing day morning. It seems another buyer above has noticed that too!. From being WiFi, it now needs a dongle. Where do we get a dongle from? CelcusTv.co.uk states Sainsburys.co.uk????? I cannot believe Sainsburys have let this sort of mis-advertising slip through a net. From what looked good value when I bought it, it now is just the same price as all the other sets of the same size, so why would I opt for a Celcus over an LG or Samsung?? I am thoroughly expecting the dongle to come free if I can ever source one because this is a blatant misrepresentation. I am not a watchdog kind of bloke but I will should this set be nearer 500 quid with a dongle!!. Watch this space..
Great TV for a great price! Not recieved dongle yet but description states it is maade for this TV..
TV convertors ALL 2D content to 3D. Finlux Andriod APP Remote Control controls the TV. Smart TV apps - But limited - and I cant find the option to search for new apps nor unable to connect to the update servers. I Ordered this BEFORE xmas and only got it on Friday even though website said 3-5 days delivery (working) which should of been first day of new year at latest. Gutted, really want one of these but can't find anywhere to get one. Does anyone know any stores which have this in stock in the south, anywhere between Devon and London really..? I had to ring customer care. They go through all stores with stock and then you decide how far you are willing to travel. I had to do a 112 mile round trip to get mine. But for that it would cost me aprox £13 in fuel. Sainsburys give you 700+ points for nectar and were also doing 10p per lire off fuel if you spent over £60 (my car takes 70 litres) so I got a good chunk of the fuel back. May be worth checking thier latest deals and going that bit further to collect. It is a great tv for the price. Just ordered £14.99 dongle for wifi. That is lowest price dongle I have seen for a smart tv. All good. anyone know if you can add more apps or stream media from a phone onto the tv? anyone know if you can add more apps or stream media from a phone onto … anyone know if you can add more apps or stream media from a phone onto the tv? Can't add more apps as yet. You can stream via a media server no problem . Dongle works great. phones connect grat and the bundled Nero software lete you view pictures from laptops, kindle hd fire and PC. iphone and android phones with youtube channel connect ok too. all good so far. Only issues to date are limited apps installed, can't yet see (but haven't looked hard) if you can use a browser app to look on internet (like google) and the tv hung coming out of one of the apps but resets when switched off/on so no real problem. You cant get a browser on the TV, there are no updates for the apps and the TV infact does not connect to the update servers anyway... not sure if thats a temp thing or what really. The TV has currently been taken off sale online due to all the mistakes in the tech spec. The TV is no longer online due to being completely sold out and potentially pr-ordered (if possible) 4 times over. The number of people wishing they had grabbed one in my area alone is frightening.
. I was very impressed with this. The reason for some anomolies, was that Sainsburys were creating a shopping ad at the same time as a dedicated Celcus website and The informationn was not duplicated accurately on both sites. Despite several minor shortcomings with smart tv and lack some features, these shortfalls only make the tv a spectacular buy as opposed to an Uber spectacular buy. No regrets whatsoever. I like to see the face of peopl who bought the 7000 and 8000 series Samsungs. I am not saying it matches but for the price difference of almost £1000 they are well impressed (as well as bemused). Would recommend this tv to anyone...if you can find one! :). Only unkown is durability but at a quarter of the cost of some similar well known TV's I see little risk. Many more expensive tv's have limited features on the smart TV and some people have had to ditch built in wifi and connect by LAN to get good streaming so more money does not guraantee better quality. The TV is no longer online due to being completely sold out and … The TV is no longer online due to being completely sold out and potentially pr-ordered (if possible) 4 times over. The number of people wishing they had grabbed one in my area alone is frightening.Most of the inaccurate tech specs were put right by sainsburys care centre within 1 day of me giving them a list . I was very impressed with this. The reason for some anomolies, was that Sainsburys were creating a shopping ad at the same time as a dedicated Celcus website and The informationn was not duplicated accurately on both sites. Despite several minor shortcomings with smart tv and lack some features, these shortfalls only make the tv a spectacular buy as opposed to an Uber spectacular buy.No regrets whatsoever. I like to see the face of peopl who bought the 7000 and 8000 series Samsungs. I am not saying it matches but for the price difference of almost £1000 they are well impressed (as well as bemused). Would recommend this tv to anyone...if you can find one! :). Only unkown is durability but at a quarter of the cost of some similar well known TV's I see little risk.Many more expensive tv's have limited features on the smart TV and some people have had to ditch built in wifi and connect by LAN to get good streaming so more money does not guraantee better quality. Hi there how much did the customer care team compensate you with? or anyone whos looking?? I was told by Sainsburys that it was taken off due to the errors in the ad, which only helps anyone whos bought one to get compensated, regaurdless of the ad mistakes its great tv, the picture quality is just as sharp as our sony 46kdl753 46inch led 3d tv which is over double its price, i also took my hard drive in store to compare 3d active against passive with various 3d files, they connected it to a top samsung tv and there was no difference between our tvs and that samsung, this is what helped me make my mind up to keep this tv as i wasnt sure at first. Lastly i had a sony tv that lasted just under 3 years before it broke down, luckly it had a 3 year cover and they replaced it with the sony i mentioned earlier, which was very lucky, so any compensation i get i will put against an extended 4yr warranty from domestic and general for around £30 to £35 a year which means im covered for 5 years in total. Just wondering how much compensation people have been given so far ????? Not sure why people would be expecting compensation for a TV with £300 off in the sale just because some of the advertised features are not as expected? The correct features are clearly written on the box when it arrives. Any nearest Sainsburys store will take the tv back if you are not happy within 28 days. Would be interested in knowing the reasons why compenation would even come into your mind? If you take the TV back into a store and get compaensated for the petrol costs then fine but if you keep the TV then you have basically accepted the anomolies surely? 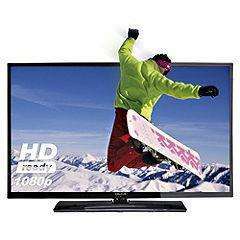 Hi buseyboyukNot sure why people would be expecting compensation for a TV … Hi buseyboyukNot sure why people would be expecting compensation for a TV with £300 off in the sale just because some of the advertised features are not as expected? The correct features are clearly written on the box when it arrives. Any nearest Sainsburys store will take the tv back if you are not happy within 28 days. Would be interested in knowing the reasons why compenation would even come into your mind?If you take the TV back into a store and get compaensated for the petrol costs then fine but if you keep the TV then you have basically accepted the anomolies surely? Damn right they should compensate me, A big company like that making misleding mistakes, i do not expect to be lied to about anything i've paid good money for regardless of it being a good deal or not, and sainsburys accepts this and has covered the costs for the missing items, if you dont mind being misled thats good for you, but i really do mind. I also really like my TV, I sent an email to Sainsburys at the time of delivery regarding to slow delivery and lack of features as advertised. Had a call back from the Customer Service Complaint team where they reduced the item price due to the lack of spec and provided a refund. Had mine for over a month now, cracking TV for the money paid. Loads of info in this thread too..
Lucky you, read the coments above and on the other link below if you want to claim some money back for the spec errors in there ads, could be worth 80 pounds or so, probably given in sainsburys points. You will also find handy tips about the tv. I've nearly had it 3 months and still loving it .